All are easily available in home and it takes just 3 to 4 minutes to make the pack. 1. At first take two spoonfuls of Rice powder. 5. Mix them thoroughly until it turns into a thick, whitish grainy mixture. Apply it gently all over the face and neck region. Now start the circular motion both in clock wise and anticlockwise direction with the tip of your finger especially on the chick, T-zone, forehead and neck region. Do it for 5minutes and then keep it for another 5-8minutes and then wash it thoroughly. The result of using this homemade scrub is truly fascinating. The skin becomes smooth, clean, soft and moisturised with a gorgeous glow! (Pure bliss)!!!! It removes the dead cells and dirt from the skin and makes it supple and glowing! It can be used twice in a week. 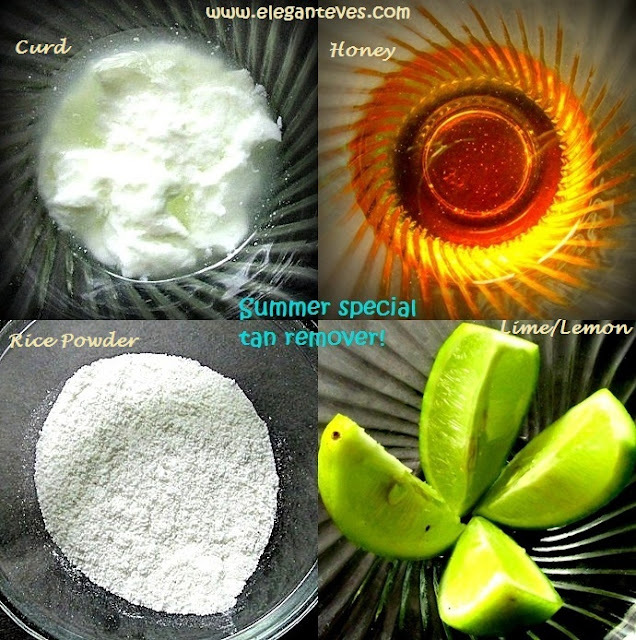 The rice powder used here acts as scrub and honey & curd both function as moisturiser! And lemon acts as the natural bleach as we all know! Let us take a glance in all the pros and cons of this pack quickly! « It can be stored in refrigerator for further use! Editor’s word’s: Very well written, Aditi! I am sure this pack will come as a savior for removing the summer tan we are all having now. 5. Ginger Venture: WONDER condiment for skin and hair issues!